Know when to enter and exit stock markets with the weekly update for the SP500 index. The free investment strategy helps you to avoid market crashes and to improve your portfolio returns. Best of all, there is no guess work and no need to lose any sleep over stock markets. 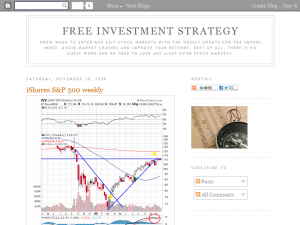 This what your Free Investment Strategy Blog Ad will look like to visitors! Of course you will want to use keywords and ad targeting to get the most out of your ad campaign! So purchase an ad space today before there all gone! If you are the owner of Free Investment Strategy, or someone who enjoys this blog why not upgrade it to a Featured Listing or Permanent Listing?